I am about to start editing my electronic book, iPads in Music Education, and I expect to wrap up any updates by the end of December. As I look through the book as it exists, much remains the same, but there are some new apps and accesories, as well as a few more resources (such as Amy Burns' FREE electronic book, called “Help, I Am An Elementary Music Educator With One Or More iPads!”). I know that I want to feature some of the wonderful new (since the last edition) apps such as NotateMe, and that I want to write a new sub chapter on accessibility. Of course, I will also include iOS 8–although I cannot personally use all of the iOS 8/OSX Yosemite features because my MacBook is too old. I just wanted to ask you–as readers of techinmusiced.com–is there anything you would like me to discuss or cover in greater detail in the next edition? If you have thoughts, please feel free to send an e-mail to techinmusiced@ g m a i l.com (no spaces). The plans are to leave any updates of the book free, at least until I hit the 5th year of the book; although new purchasers will have to pay for the book. So again, the update will be free for any existing owners of the book. That said, any apps purchased via the links in the book will help provide some continued financial income from the project. I had originally planned an update after iOS 7, but it is clear that an update is not immediately needed. The biggest thing that has changed, really, between my current edition of my interactive book (centered on iOS 6) and iOS 7 is control center. Instead of pressing the home button and swiping to the right to get to AirPlay, dimming, and audio controls, you now do all of that through control center by swiping up on the iPad. Spotlight search is different (now a swipe down on any “home” screen of apps–but not from the edge, or you will pull up notifications), there is a blue “jelly” next to any app that has been updated (important as apps self-update), and there is a unified search bar/URL bar in Safari. Oh…and folders now hold unlimited apps, but only show nine at a time (I don’t “get” this on the iPad). And other than an interface that looks completely different, iOS 7 works just the same–so everything else in the interactive book still holds true. That isn’t even a chapter’s worth of operational changes. Additionally, the iPad’s greatest flaw (access to writing to the music library of the iPad) still remains (to my great frustration). I personally wonder if we will see any updates to iOS 7 specifically for iPads at the iPad event which should occur next month. We shall see. Two items: SmartMusic and PTfME (my first book) updates! I have two items to share this evening. First, MakeMusic released the latest version of SmartMusic for computers this afternoon. This version allows for three types of subscriptions: educator, student, and practice room. If you have an educator or student subscription, you may use any computer that has SmartMusic installed. There is no longer a limit of one computer per subscription–although you can only use your subscription in one place at a time. The practice room subscription must be “pinned” to a location…allowing anyone with a SmartMusic account to use the program. If that sounds confusing, the new practice room subscription follows the old subscription plan: a computer is authorized versus the user being authorized to use the subscription. It looks like you can choose where to “pin” that subscription, allowing you to move it from a computer to an iPad if necessary (or vice versa). I believe that current pricing is: $140 educator, $40 student, $44 practice room. Here is more about SmartMusic (link), directly from MakeMusic. By the way, this is NOT the new version of SmartMusic for iPad that will allow for student assignments…that is coming soon. The second bit of news is that the new edition of my first interactive book on the iBookstore, has been approved by Apple. The book is called “Practical Technology for Music Education,” and should be a free update for anyone that has previously purchased the book. The book is now $9.99, reflecting my plans to continue to update the book rather than to sell different editions of the book. In the long run, that still translates to about $5.00 per book after Apple’s 30% and taxes. New features include a portrait-only orientation, corrections, and new chapters on Chromebooks and Android devices. I did remove some of the iOS information in the book, such as the iOS tips and tricks and the gigantic app lists–but there are still plenty of app recommendations and lists for each of the major devices listed in the book. The joy of writing these interactive books is that no project is ever “finished.” I’m sure there are errors in the book, and as I find them, I will fix them. As always, feel free to e-mail with corrections, product tips, and so on. If you are looking for an iOS (iPad) focused book, I would suggest my other work from this past summer, iPads in Music Education. I have been using iPads in my music classes–daily–since the iPad was introduced in 2010. Since that time I have given dozens of presentations on how iPads can be used in music education, and I released a book on the iBookstore entitled “Practical Technology in Music Education.” Over the past year, it became clear to me that a book specifically about the iPad and its use in music education was needed. Over the past months, the book came together, and is now available on the iBookstore. It is selling for $8.99 (1). The new book contains special interactive features, such as interactive widgets for websites and YouTube videos from Bookry, some personally-created videos only available via the book (e.g. a how-to video on wireless mirroring, which is the #1 question at presentations), and even a few 3D models from the Google 3D warehouse. I am also in the process of reworking “Practical Technology for Music Education,” and have moved (and updated) the comprehensive iPad app list from PTfME to iPads in Music Education (there are still app lists in PTfME, but not at the same depth…the new chapters in PTfME reflect recent changes in technology, such as the Chromebook, and “Key Apps” for all those devices). 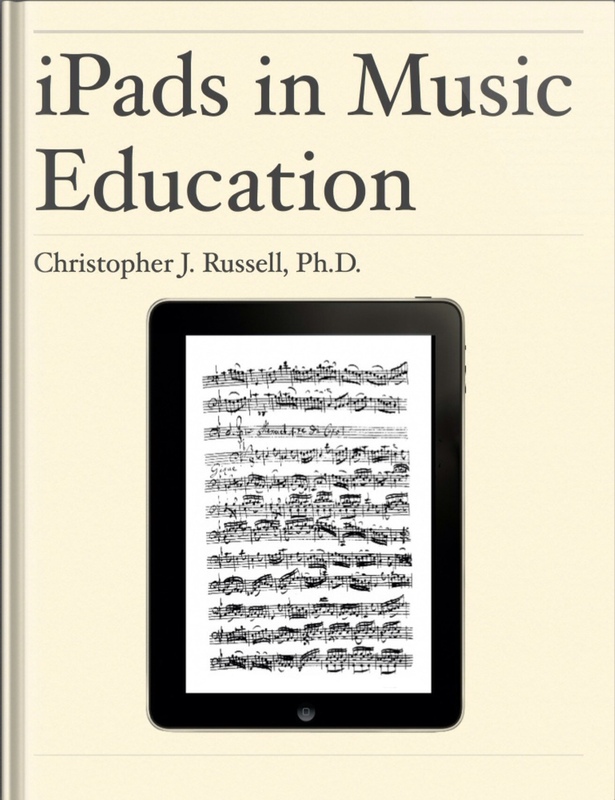 If you are looking for a how-to book on the use of iPads in music education, I hope you will consider my new book! (1) If you are curious about why I chose $8.99, I figure that after Apple’s 30% and the government’s (national and state) cut, will yield income of under $4.00 per copy sold. Additionally, I plan to release free updates to the book versus selling new versions, making it important that the income from the book reflects that change in the ability to update the book. I have not downloaded any of the books yet–I'm not sure I would use a level one book; and I think my 8th grade stepson will be out of book one by this time (trombone). I think the iBook approach is great, but there are two negatives. First, you can't write in the book, and every music teacher I've ever had has written in my books. I'm not sure how that will go over with music teachers. Second, the iBook lacks the assessment component of SmartMusic for the Essential Elements method books, which is fantastic on the iPad. I believe the Internet version of Essential Elements also has some type of “SmartMusic” functionality, but I do not know if it works on an iPad. Still, were I a band teacher at a 1:1 school (I'm not–I teach choir), I'd be tempted to encourage my students to buy this version. Then I would go out and purchase a copy of every book and send it away to 1DollarScan to be scanned for my use in lessons. This is a really interesting decision…choosing to go with a book versus an app. And I'm okay with that. It gives Hal Leonard the freedom to ask $8.99, which is an affordable iBook, whereas that would be a truly expensive app. Paul Shimmons reports that the iBook uses under 400MB on an iPad (some take over 2GB), so it is also easy on the memory of 16GB iPads 2s that dominate education.